I scribble these lines to you mid-October ~~ which is typically a cooling introduction to autumn. But here in Southern California, our summer has decided not to give way to a beckoning fall, but rather remain with us for much longer. Those of you residing nearby know what I am talking about ~~ 90 days of heat and humidity have tested us all. I’m beginning to think that I won’t need to wear anything with sleeves until 2016! That being said, because of the extreme heat, my entire backyard has been in full bloom for nearly six months straight ~~ and shows no signs of slowing down. The photo above was taken in my yard last week. 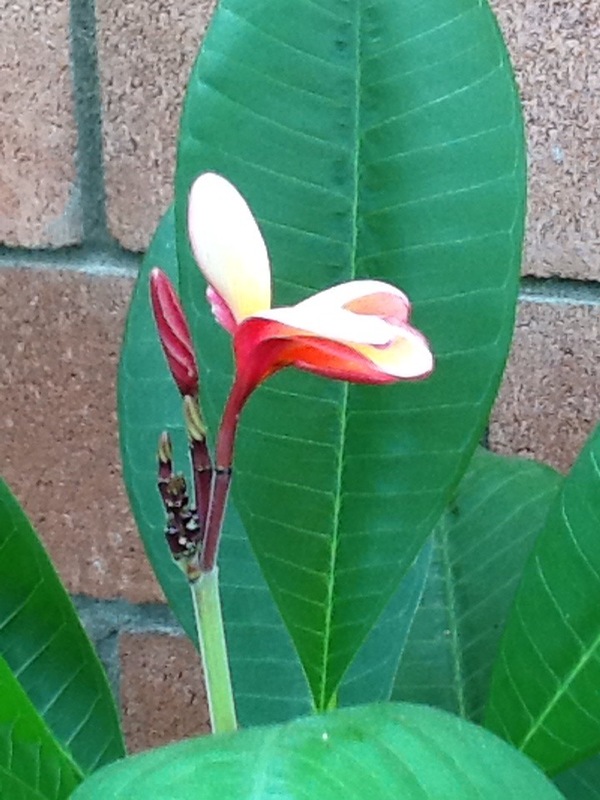 It’s one of several plumeria plants that we have outlining the yard. This particular plant has special meaning. For approximately 2-1/2 years, this precious plant did not bear any blooms ~~ not one single one. It had a fair amount of leaves but nothing ever produced beyond that. Out of frustration my husband had decided to pull it out and have it destroyed. And then as if the plant itself heard the ‘threat,’ a tiny blossom appeared ~~ almost overnight. Soon after, several began to surface. Much to our amazement, the plant not only survived, it thrives! It is referred to as our late bloomer. 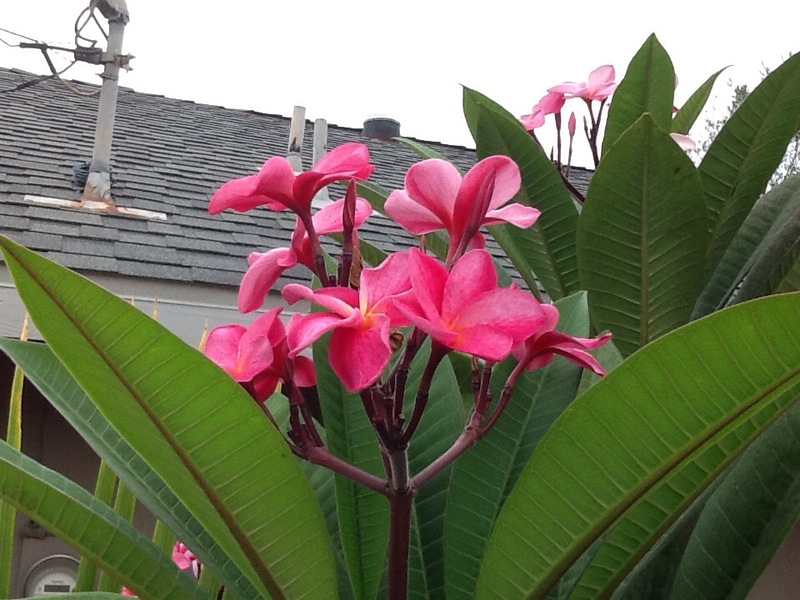 Ironically, it was the first of our productive pink plumeria plants (and oh, how I waited long to have pink appear in our yard). Here’s another bonus: she blooms closest to our trash bins! I’ve always thought of myself as a perpetual late bloomer. Late on fashion trends, late on understanding electronic devices, late on what movies are currently showing, and even late on grasping certain concepts. But this plant is a daily reminder to me that though she may seem to bloom late for us, she blooms beautifully on time for the Creator that put her right where she is planted. As I speculated these thoughts, I imagined God breathing life into this blooming plant and then sealing it up ~~ for a time when she would bloom for Him ~~ and leave behind her sweet aroma. Ecclesiastes 3:11 Yet God has made everything beautiful for its own time. He has planted eternity in the human heart, but even so, people cannot see the whole scope of God’s work from beginning to end. Wherever you are in your Journey, Sweet Girlfriend of mine, bloom and leave behind an aromatic scent of Jesus. You are right on time.